For those who do not pay that close attention to politics and hardly know the inside workings of campaigns. 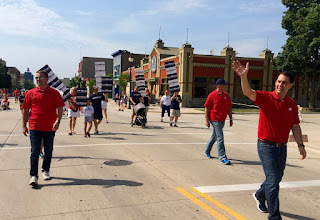 There is a fairly consistent phenomena of campaigns sending a kid to video their opponents hoping to film them doing or saying something dumb so that they can make an ad/issue out of a misstep during the election. It is so much easier to use millions to smear your opponent for a misstep, than it is to let everyone judge you on your policy positions. Mahlon, had a "tracker" following him around with a camera and decided to turn it around and film the tracker(Video here). The video shows Stelter videotaping Mitchell. Mitchell starts asking him who he works for and how much he’s paid. Stelter responds that he doesn’t make as much as Mitchell makes as a firefighter and president of the state firefighter union. Stelter then climbs into his car and drives off as Mitchell asks why he follows him around. You can say that it is just the way politics works, but I would submit that I am curious why it took Mitchell so long to confront him and that allowing these guys to follow you around is downright dangerous. In the era of concealed carry, if the "tracker" does not have to identify themselves, how would you know who he was? Do you just assume that he is assigned by the opposition. What if he is someone that has believe the hype and believes that Democrats are the enemy of the people and is there on his own? What if something Mitchell says while having conversations at the doors triggers him? Has anyone done a background check on Ben? How much does he agree with Ted Nugent? Gabby Giffords showed us that it is dangerous to be a Democrat in public. We also were witness recently to the Stand Your Ground/Castle Doctrine GOP law in action. Markeis McGlockton was shot and killed July 19 outside a convenience store in Clearwater by Michael Drejka, sheriff's detectives say, after McGlockton shoved Drejka to the ground for confronting McGlockton's girlfriend over a parking space.Drejka was not arrested, with the Pinellas County sheriff saying the "stand your ground" law appears to give him immunity because he feared a further attack. Sheriff's detectives said Drejka, 47, approached Jacobs while McGlockton and the couple's 5-year-old son went into the store. Drejka and Jacobs began arguing about her parking in a handicapped parking space.Jacobs concedes she parked in a handicapped spot outside the Circle A Food Store in Clearwater, and told "Good Morning America" this week that Drejka pulled up in a silver SUV and began yelling and cursing at her. "(McGlockton) comes out and sees a guy yelling at me and I'm sitting in the car. So, by this time, my man is defending me and defending his children so he pushes the guy down," she told the ABC show.Jacobs said her two younger children were in the car with her. 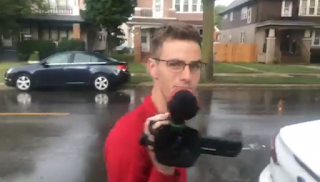 We see in the video that Mahlon Mitchell took, when he asked Stelter, who he was working for, Stelter cowered in fear and ran to his car and drove away. How long until they send a kid who when he gets acknowledged, or asked a question, feels his life is threatened and takes steps to "defend himself"? How long until a crowd gathers around the tracker and he slips and pulls his gun? 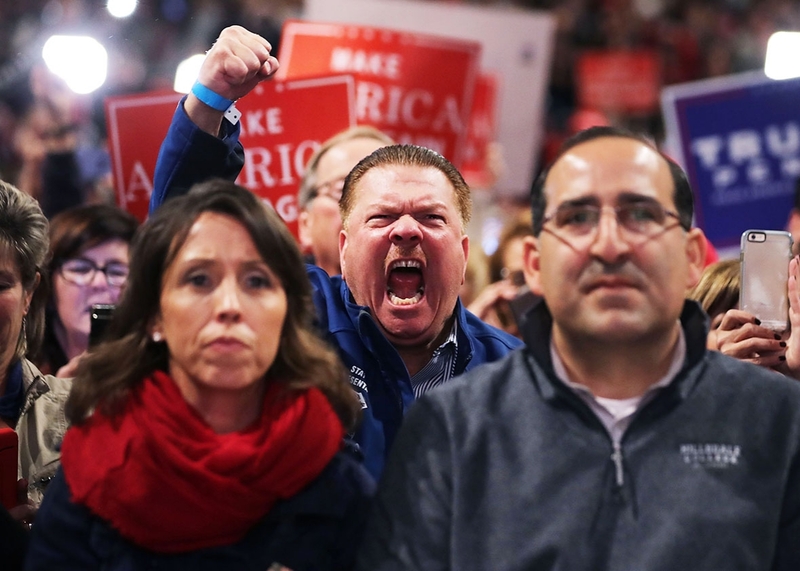 A privileged white boy introvert, following a Democrat of color who he has learned to fear and conditioned to think of as the enemy, in a diverse or less affluent neighborhood. while concealed carrying could lead to disaster. While I personally believe that its a lowlife, TMZ thing to do by following someone around perpetually with a camera, I also realize that politics is a unique sport and logic and common sense is not allowed. 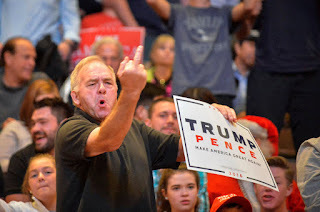 When you have this happen at a rally for the GOP Presidential nominee and his response is he promises to pay the legal bills of anyone else who does so, you can not be to careful. Hopefully we look back upon Mahlon Mitchell confronting his tracker as a break water point in making candidates safer as they run for office. Edit note: How could a guy who feels he needs security with him at all time send some young introverted possible psycho to follow Democratic Candidates wherever they go? Now he's against trackers. Fine with it when it was just Democrats doing it. I was recently at a 4 county forum for Tammy Baldwin at a park shelter in Berlin, WI. There was a tracker filming from the parking lot. Tammy's staff said he is always following her. One of the attendees asked the tracker who he was, he said his father ran a PAC for republicans. The tracker stayed for the entire event and followed and filmed Tammy out to her car until she left. CREEPY! "Credentials"? What arm of Big Brother government is going to credential them? Who credentials the tracker known as Michael Moore? What "reason" would be acceptable? The same arm of big govt that forces me to show an id at the polls, or the airport, or if your press, or to get in to a school or a business....should i go on? There are too many unhinged gun loving right wing lunatics out there. Plus if your going to send a tracker, own it. If you are in politics and dont know who Michael moore is thats on you. However if he shows up with a camera crew, I doubt if you ask him who he is, he will run crying to his car and speed away.